Here it is, the final instalment of our indoor activities for Toddlers. We have had so much fun putting this collection together and have had even more fun trying out so many of the fun activities. 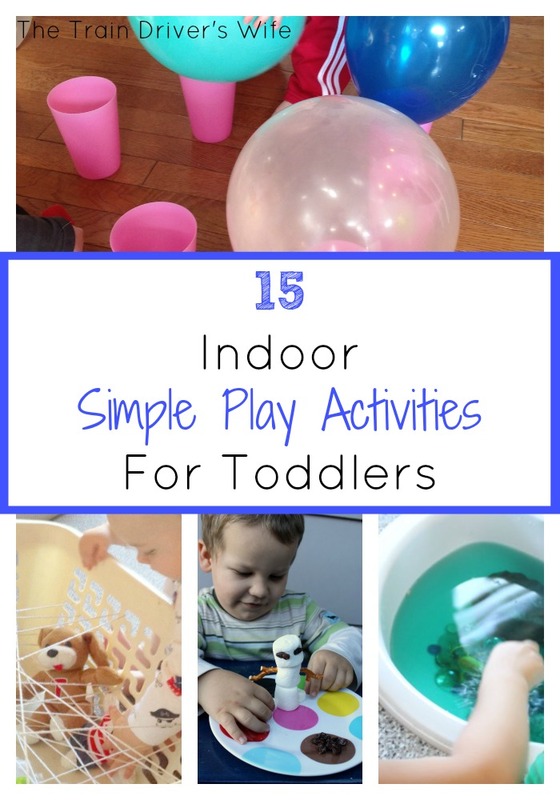 This week I’ll be sharing 15 Indoor Simple Play Ideas for Toddlers. If you missed our previous activities, why not check them out here. And if that isn’t enough to keep you and your little one occupied on a rainy day, why not check out these Simple Play Ideas too! A laundry basket and some string are all you need for this fun and imaginative Spider’s Web Discovery Basket. Your little one can work on their problem solving and dexterity too! What is more simple than water? This Simple Fun Sink Play from Mama Papa Bubba will guarantee you hours of fun. Do you wanna build a snowman? Well now you can with this Easy Snowman Building Activity from Barefeet on the Dashboard. Your Toddler will love this simple Infant Ball Pit from Carrots Are Orange. We love this creative Simple Box Play from Danya Banya. So many ways to enjoy simple household objects! Imaginary role play couldn’t be more simple than this easy Cardboard Post Box. If your little one is a budding motorist, this Bubble Wrap Road from Sunny Day Family is sure to occupy them for hours. We love this Simple Fun Colour Sort Game from Mama Papa Bubba. You could use any suitable available items for a quick and easy activity. Practice building (and no doubt some demolition too) with this Car Track and Block City from Stay at Home Educator. Get your little ones moving with this Simple Balloon Play from Sunny Day Family. You can use any suitable items you have to hand to enjoy this simple Toddler Colour Matching activity from A Mom with a Lesson Plan. Enjoy some chill out time with these simple and colourful Rainbow Discovery Bottles. Get scooping and discovering with this Simple Lego Soup from My Mundane and Miraculous Life. Help your toddler search for their favourite images with this Magazine Find and Seek from My Mundane and Miraculous Life. For us, this would resemble a page full of washing machines and hoovers! What’s in the bag Sensory Game from My Mundane and Miraculous Life. So what do you think? Have you enjoyed this round up of activities? We hope you have loved it as much as we have! Don’t forget to check out our other Toddler Indoor Play Activities here too. Thanks for including some of our activities! This is such a great list, especially since it’s been too cold to play outside lately.